Believe it or not, apples, the same fruit that's supposed to keep the doctor away might actually send you to the hospital. 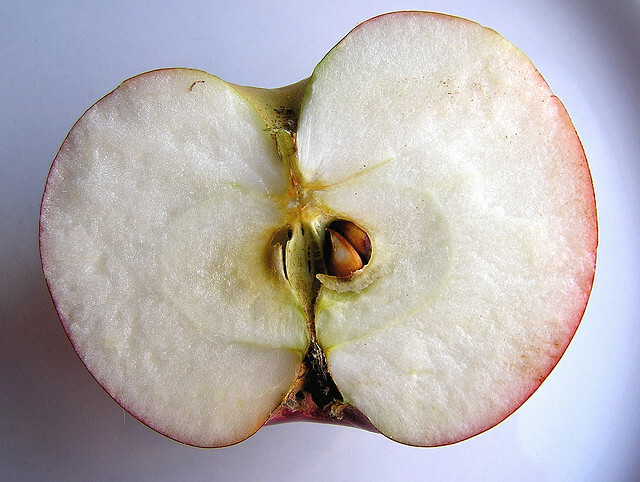 Turns out, apple seeds contain cyanide, which can cause stomach agitation and vomiting. Okay, so the seed casings are extremely tough -- there's little risk unless they're pulverized, or chewed up. Even then, you'd need to eat a lot for it to be fatal. But there are other components to common foods that could have painful, even deadly effects. Here are eleven pretty common foods that could kill you, followed by some more exotic deadly dinners. What could hurt you: Like apples, cherries contain a type of hydrogen cyanide called prussic acid. How much can kill you: Don't go eating a cup of ground pits, or peach and apricot pits for that matter. What could hurt you: Rhubarb leaves contain oxalic acid, which causes kidney stones. How much can kill you: It'll take 11 pounds of leaves to be fatal, but much less to make you seriously ill.
What could hurt you: Nutmeg is actually a hallucinogenic. How much can kill you: Yes, you can trip on it, but it's said that eating just 0.2 oz of nutmeg could lead to convulsions, and 0.3 oz could lead to seizures. Eating one whole will supposedly lead to a type of "nutmeg psychosis", which includes a sense of impending doom. What could hurt you: Glycoalkaloids, also found in nightshade, can be found in the leaves, stems, and sprouts of potatoes. It can also build up in the potato if it's left too long, especially in the light. Eating glycoalkaloids will lead to cramping, diarrhea, confused headaches, or even coma and death. How much could kill you: It's said that just 3 to 6 mg per kilogram of body weight could be fatal. Avoid potatoes with a greenish tinge. What could hurt you: There are two variations of almonds, sweet almonds and bitter almonds. The bitter ones supposedly contain relatively large amounts of hydrogen cyanide. How much could kill you: It's said that even eating just 7 - 10 raw bitter almonds can cause problems for adults, and could be fatal for children. What could hurt you: Because it doesn't go through the pasteurization process in which harmful toxins are killed, unpasteurized honey often contains grayanotoxin. That can lead to dizziness, weakness, excessive sweating, nausea, and vomiting that last for 24 hours. How much could kill you: Typically just one tablespoon of concentrated grayanotoxin can cause the symptoms above. Consuming multiple tablespoons would be a bad idea. What could hurt you: The stems and leaves of tomatoes contain alkali poisons that can cause stomach agitation. Unripe green tomatoes have been said to have the same effect. How much could kill you: You would need to consume vast quantities for it to be fatal. Not exactly high-risk, but you might avoid eating tomato leaves. What could hurt you: The danger in tuna is the mercury that the fish absorbs. Once in your body, mercury will either pass through your kidneys, or travel to your brain and supposedly drive you insane. How much could kill you: The FDA recommends children and pregnant women do not consume tuna at all. While it's unlikely that eating a massive amount of tuna in one sitting will kill you, it's a good idea to monitor your weekly intake. What could hurt you: If not prepared correctly, or eaten raw, it turns into hydrogen cyanide. How much could kill you: There are two variations: bitter and sweet. The sweet variety is 50 times less harmful, packing only 20 mg of cyanide per kg of fresh root. Still, twice is supposedly enough to kill a cow. What could hurt you: Raw cashews you might find in a supermarket are not actually raw, as they've been steamed to remove the urushiol, a chemical also found in poison ivy. This chemical can cause the same effect as poison ivy, or poison oak. How much could kill you: High levels of urushiol can supposedly prove fatal. People who are allergic to poison ivy are likely to have a fatal allergic reaction to eating actual raw cashews. What could hurt you: These berries are often used in jams, jellies, and wines. Their leaves, twigs, and seeds contain cyanide-producing glycoside. Nausea, vomiting, diarrhea, and coma are the symptoms to look forward to. How much could kill you: Suffice it to say, hope your herbal tea was prepared correctly, and that whoever made your jam or wine strained the fruit. Also, never eat them unripe. So it seems there really can be too much of a good thing. And while none of the foods above may be fatal in reasonable doses, there are plenty of dishes that can be deadly if not prepared properly.